We have all heard about the Battle of the Bulge at the end of World War II when the Hitler's army made a desperate attempt to break through the lines of the Allied Army. 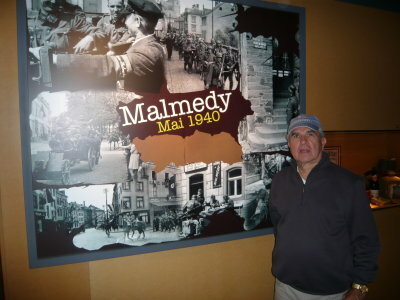 One place where the Germans attacked was at the village of Malmédy, Belgium, where elements of the Kampfgruppe Peiper, part of the 1st SS Panzer Division under the command of Lt. Col. Joachim Peiper, came upon an American convoy at the Baugnez Crossroads just outside Malmédy. The convoy consisted mainly of men from B Battery of the 285th Field Artillery Observation Battalion based at Fort Sill, Oklahoma. Early accounts claimed that only men from this Battery were involved. However, elements of the 200th Field Artillery Battalion, the Reconnaissance Company of the 32nd Armored Regiment, the 86th Engineer Battalion, the 546th Ambulance Company, and the 575th Ambulance Company among others were also in the convoy. When the SS came upon the convoy, they fired a few shots and the overmatched convoy was captured. American soldiers in the convoy were rounded up and placed under guard in a nearby field. What happened next is still argued. Some German reports claim that the POWs all tried to escape by running away. American accounts say that a German SPW armored vehicle came down the road and lowered its cannon toward the men at close range, convincing some of the captives at that point that the Germans intended to shoot them. However, the SPW had trouble jockeying into position to cover the American soldiers in the field and gave up. Shortly afterward the fears of the captives came true when several members of the German SS opened fire on the POWs with machine guns. When it was all over, at least 84 American soldiers had been gunned down. German claims that the men had all tried to escape are totally inconsistent with reports of the few survivors who were only wounded and played dead. They reported that after the machine guns went silent, the SS walked around with pistols and finished off any soldier that was moving or making any noise. The SS left the soldiers where they fell when they departed. The killing of these POWs by the German SS became known later as the Malmédy Massacre. After Stan retired from the U.S. Navy, he lived in Europe for seven years. And my wife and I visited him and his wife twice while they lived there. Both times that we visited, we made sure that we included a trip to Malmédy to see the site where the massacre happened and the memorial that had been built to honor the men killed there. Our last visit to Europe and my last visit to Malmédy was in 2007. 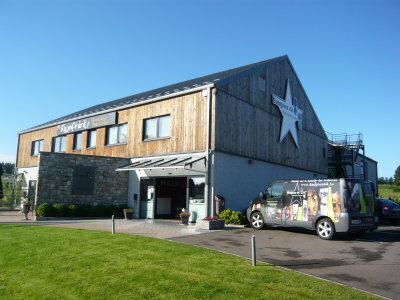 Some time after our visit, a museum was erected to tell visitors about the event. Stan visited the museum shortly after it opened while he was still living in Europe. I had never visited the museum. 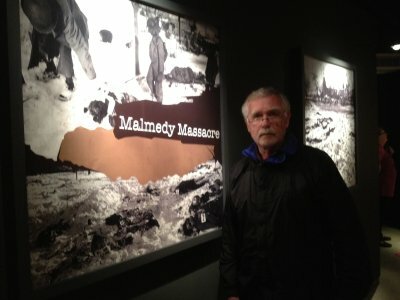 So on this trip to Europe with Stan, the site of the Malmédy Massacre and the new museum were added to our itinerary. Our first stop was the memorial to the men who died in the massacre. 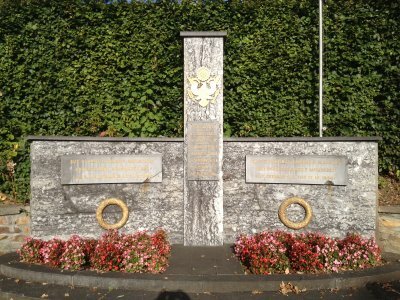 The picture below shows the memorial that sits on the corner of Baugnez Crossroads, the closest intersection to the place where the massacre happened. 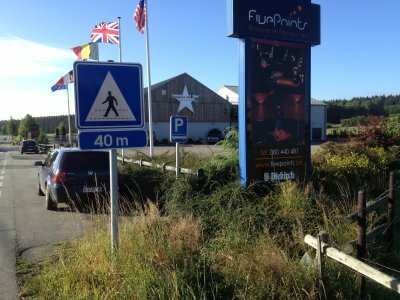 The picture below shows the memorial from the vantage point of the Baugnez Crossroads. 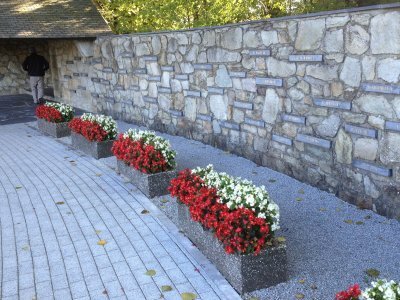 The memorial is sort of a shelter with a stone wall extending off to the right with the names of the victims on plaques on the wall. The American flag is visible on the flag pole in front of the flowers in the foreground. The picture below shows another view of the memorial taken from the right. 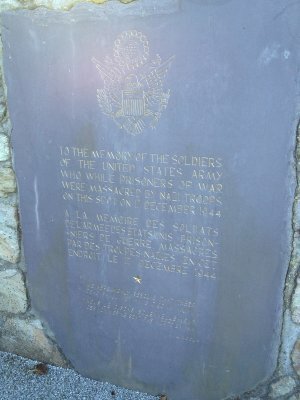 The picture below shows a closer view of the memorial. 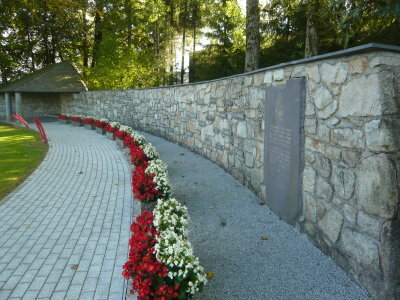 In this picture it is also easier to see the dark, rectangular blocks of stone on which the names of victims are inscribed. 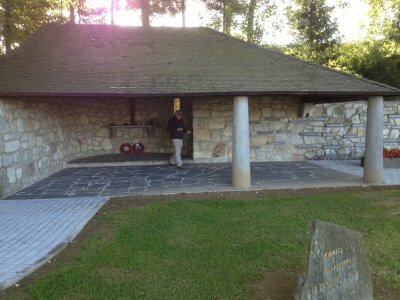 The picture below shows a closer view of the shelter that is part of the Malmédy Massacre Memorial. 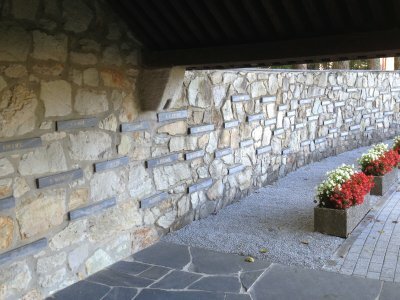 The picture below shows a view from under the Malmédy Massacre Memorial shelter and the stone wall with the dark rectangular blocks on which names of victims are inscribed. The picture below shows the dark rectangular block with the name of L.M. Burney on it. L.M. 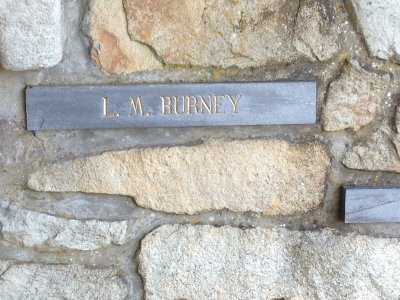 Burney was another ambulance driver like Uncle Howard. He took my load and he got captured and shot at the Malmédy Massacre. It would have been me if I had taken that load. I think of that often. 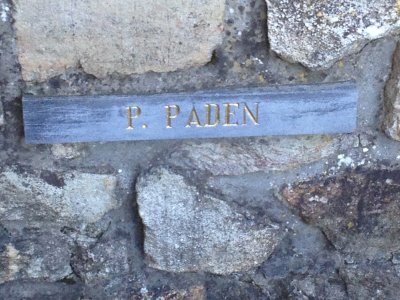 The picture below shows the dark rectangular block with the name of Paul Paden on it. Paul Paden or "Pappy" Paden as Uncle Howard called him, was part of the 575th Ambulance Motor Company to which Uncle Howard belonged. Pappy Paden and I slept in the same bed that night. The next day, December 16, 1944, he was dead along with many others of our outfit. The picture below shows a block of slate with an inscription about the victims of the massacre. The inscription appears in both English and French. SHALL NOT HAVE DIED IN VAIN"
The picture below shows a stone with another inscription about the victims. 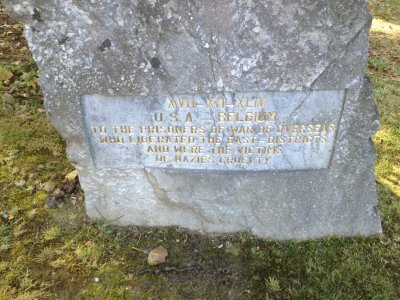 The Roman numerals in the first line of the inscription above are 17-12-44, which obviously stand for 17 December 1944, the date of the Malmédy Massacre. 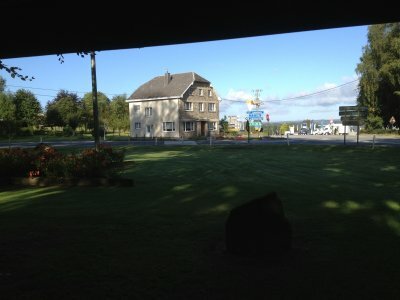 The picture below is of the Baugnez Crossroads as seen from the shelter at the Malmédy Massacre Memorial. In the picture Route de Waimes comes in from the right and proceeds straight ahead in the picture in the direction of Malmédy. Route de Luxembourg comes in along the left side of the picture and intersects with Route de Waimes at the crossroads. 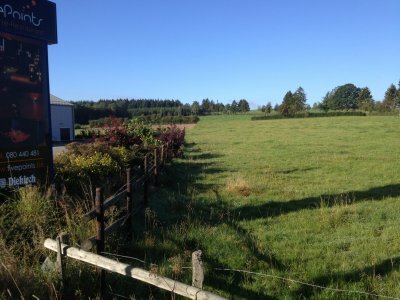 The actual site of the massacre was in a field across Route de Luxembourg and back down the road about 100 yards. The GPS coordinates of the Malmédy Massacre Memorial discussed above are 50.403639N, 6.066711E. Click on the coordinates to see the location on Google Maps. The picture below shows the new museum, Baugnez 44, that was built in the field beside where the soldiers were killed in the Malmédy Massacure. The Baugnez 44 Museum maintains a web site that may be reached by clicking here. 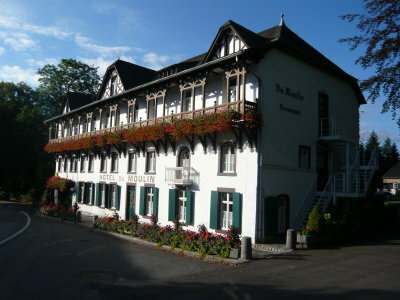 The picture below is another view of the Baugnez 44 Museum. The GPS coordinates of the Baugnez 44 Museum shown above are 50.401898N, 6.066166E. Click on the coordinates to see the location on Google Maps. The picture below is my attempt at a panoramic view of the field where the soldiers were killed. One can see Route de Luxembourg on the left edge of the picture with the Baugnez 44 Museum beside Route de Luxembourg in that part of the picture, the killing field in the middle, and Route de Luxembourg again on the right looking toward Baugnez Crossroads in the distance. The panoramic view is made up of the five pictures that follow the panoramic view. Matching of the edges of one picture with same region of the adjacent picture was not always perfect due to parallax effects. However, it gives you a good idea of the area where the massacre occurred. The picture below is picture 1 of 5 starting from the left that were used to create the panoramic view of the field where soldiers were killed in the Malmédy Massacre. The picture below is picture 2 of 5 starting from the left that were used to create the panoramic view of the field where soldiers were killed in the Malmédy Massacre. 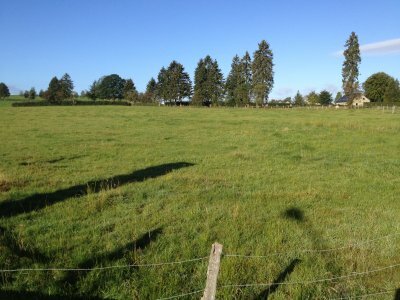 The picture below is picture 3 of 5 starting from the left that were used to create the panoramic view of the field where soldiers were killed in the Malmédy Massacre. The picture below is picture 4 of 5 starting from the left that were used to create the panoramic view of the field where soldiers were killed in the Malmédy Massacre. The picture below is picture 5 of 5 starting from the left that were used to create the panoramic view of the field where soldiers were killed in the Malmédy Massacre. When Stan and I finished visiting the Malmédy Memorial and the field where the soldiers were massacred by the German SS, we went inside Baugnez 44, the museum dedicated to the massacre. 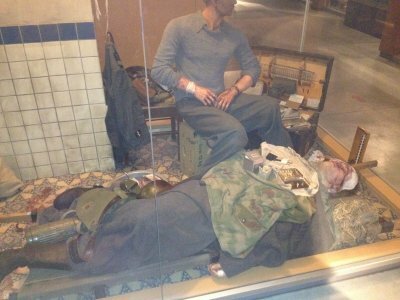 The picture below shows Stan by one of the signs in the Museum. The picture below shows me beside another of the sign in the museum. 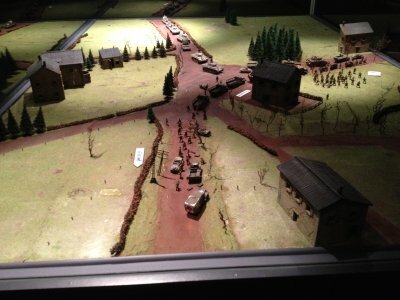 The picture below shows a scale model of Baugnez Crossroads where the massacre occurred. The aforementioned Route de Waimes runs from the top of the picture out the bottom of the picture. Malmédy is in the direction headed out the bottom of the picture. Route de Luxembourg is the road that heads out the right side of the picture from the crossroads. In the picture above the American convoy was headed from Malmédy at the bottom of the picture toward the crossroads and was turning right at the crossroads onto Route de Luxembourg. The Germans in the 1st Panzer Division approached the crossroads coming on Route de Waimes from the top of the picture. One can see the soldiers beside some of the vehicles and also in the field beside Route de Luxembourg on the right side of the picture. The location of today's Malmédy Massacre Memorial that was shown above is just in front of the little grove of trees located above and to the right of the crossroads. The location of today's Baugnez 44 Museum is just to the right of where all of the soldiers are shown in the field beside Route de Luxembourg. There is a white card in the field marking the location of Baugnez 44. The alert reader may see the red cross on the back of the last vehicle on the road coming from Malmédy in the direction from the bottom of the picture. We noted above that units of our Uncle Howard's 575th Ambulance Company were part of the American convoy. According to the aforementioned book about the Massacre by John M. Bauserman, there were two ambulances from the 575th Ambulance Company that were part of the convoy. The first had 1st Lt. Carl Guenther and his driver, Pfc. Paul "Pappy" Payden, mentioned above. Both were killed in the massacre. According to Bauserman, the very last vehicle in the American convoy was the ambulance with Pfc. L.M. Burney and Pvt. Roy Anderson. This Pfc. L.M. Burney is the soldier mentioned above who took the load of wounded that Uncle Howard was expecting to take to the hospital. Only Pfc. L.M. Burney in this last vehicle was killed. Pvt. Anderson survived. The picture below is another picture of the scale model of Baugnez Crossroads as viewed from Route de Luxembourg looking toward the crossroads. In this picture Route de Waimes runs from left to right through the picture and Route de Luxembourg heads up from the bottom of the picture toward the middle of the picture where it intersects with Route de Waimes at the Baugnez Crossroads. The direction of Malmédy is toward the left on Route de Waimes. The American convoy came on Route de Waimes from the left and turned right onto Route de Luxembourg to head out the bottom of the picture. The Germans approached from the right and made a left turn onto Route de Luxembourg also heading out the bottom of the picture. In the picture above one can see the soldiers in the field to the left of Route de Luxembourg that runs from the crossroads and out the bottom of the picture. 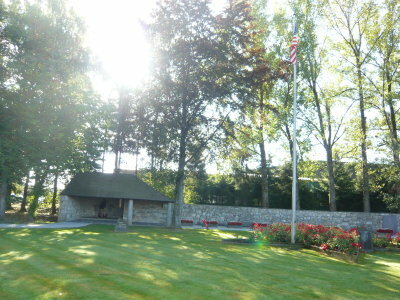 Today's Malmédy Massacre Memorial is located just on the other side of the grove of trees to the right of Route de Luxembourg at the intersection. 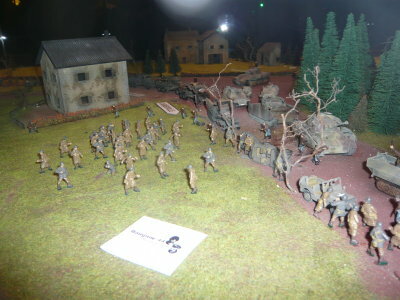 Today's Baugnez 44 Museum is where the white card appears near the bottom of the picture in the field beside the soldiers. The picture below is a closer view of part of the picture shown above. 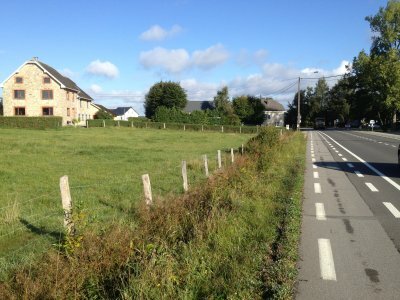 The picture below shows the Baugnez Crossroads, Route de Luxembourg, and the field where the American POWs were grouped by Peiper's soldiers and massacred. 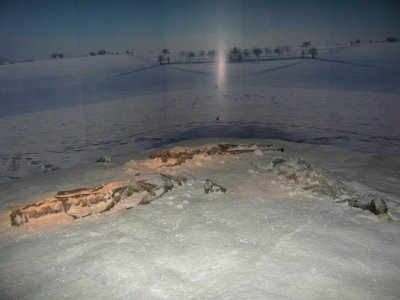 The picture below shows a model of the field where the snow-covered bodies of the victims were found. One can see the "bodies" in the snow in the foreground. The American army discovered the massacre the next morning when a Captain Edward Schenk arrived at Baugnez Crossroads on this way to Malmédy from nearby Butgenbach. Interestingly, he was approached Malmédy on Route de Waimes, the same road that the Panzers had used the day before to approach the Baugnez Crossroads. 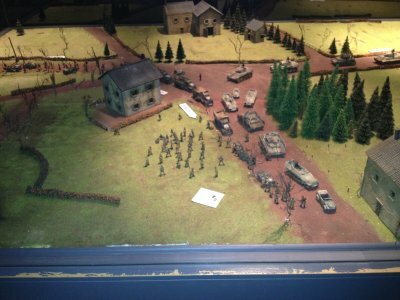 When Captain Schenk approached the Baugnez Crossroads, civilians waved frantically to get his attention. Upon hearing the news of what had happened the previous day, he investigated and found the victims. He also found at least one wounded survivor. In a curious quirk of history, the above mentioned book by Bauserman reports that Captain Schenk who found the victims had with him in his command car a Sgt. Garn. I have never discovered the first name of this Sgt. Garn who was part of the discovery of the victims of this massacre or how he might have been related to me. I recall searching for a Garn in the same unit that Capt. Schenk served in and being unable to find anyone named Garn in the unit. Perhaps this Sgt. Garn wasn't really part of Capt. Schenk's unit or perhaps Bauserman got the name wrong. 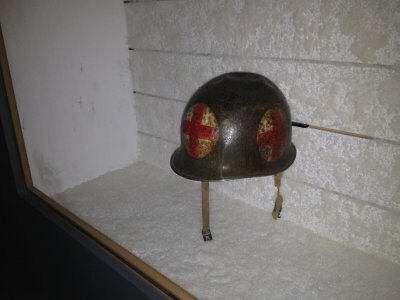 The picture below shows a medic's helmet that was on display at the museum. Undoubtedly this was included because a number of men who were killed were either medics or were ambulance drivers. The picture below shows the display of a wounded soldier, someone who is either a medic or a doctor, and some of the tools used by the medic. The picture below shows another scene of what life might have been like during the Battle of the Bulge. 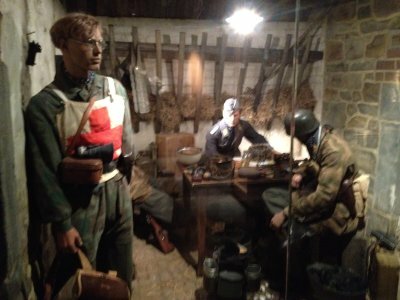 The soldier on the left in the display is clearly a part of some medical corps. About three or four miles down Route de Luxembourg is the Hotel de Moulin in Ligneuville, Belgium. At the time of the massacre, an American General was using this hotel as his headquarters. Somehow the German SS soldiers in the Panzer Division that came through the Baugnez Crossroads learned he was there and went as quickly as possible to the hotel in an attempt to capture him. Somehow word of the Germans' approach got to the general just in time. He escaped minutes before the Germans arrived. 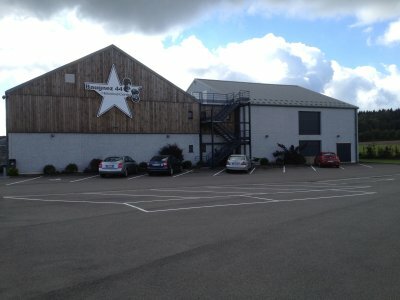 Although the general mentioned above was able to escape from the Hotel de Moulin before the SS arrived, some of the American soldiers there did not have time to escape and were captured. These soldiers were also killed by the German SS, possibly because they didn't want any delays caused by prisoners and possibly out of spite because the Germans had failed in their real objective in going to the Hotel de Moulin, that objective being to capture the general. The picture below shows the monument that was placed next to the Hotel de Moulin in honor of the eight soldiers killed there. We note here that the name of Lincoln Abraham above actually appears on the plaque as Abraham Lincoln. However, his name was Lincoln Abraham, as given here, not Abraham Lincoln. 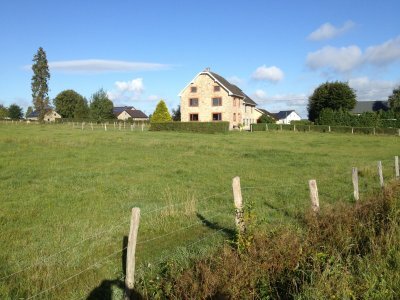 The GPS coordinates of the Hotel de Moulin in Ligneuville are 50.375713N, 6.054126E. Click on the coordinates to see the location on Google Maps. I cannot leave the Baugnez Crossroads and Malmédy without showing a picture from inside the little sandwich shop near Baugnez Crossroads where Stan and I stopped for a sandwich. As we were sitting there eating, I spotted a picture high up on the wall. The picture below shows the wall and picture that I spotted high up on the wall. The thing that caught my eye was the picture. As I looked at it while eating my sandwich, I became convinced I'd seen it before. And I had. The picture below is the same picture that was mounted on the wall in the sandwich shop near Baugnez Crossroads. 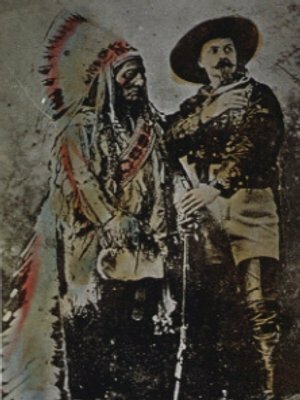 It is of Chief Sitting Bull and Buffalo Bill. 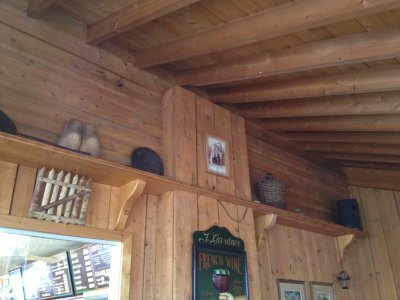 The use of this picture that is from the American West in a sandwich shop near the Baugnez Crossroads suggests that American culture and themes are still popular in Europe.